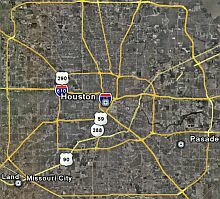 A few weeks ago, a new photo browsing network link was introduced which is filling the gap left by the currently non-functional Flickr Photos network link for showing georeferenced photos in Google Earth. Panoramio not only provides a Google Earth network link for browsing photos all over the world, but also allows you to quickly and easily mark a location on a Google Maps mashup where you took a photo(s) and upload the photo(s) to their database with a description. The service is free to use and was created by two guys in Spain named Joaquín Cuenca Abela and Eduardo Manchón Aguilar. My friend Valery Hronusov from Russia's Academy of Science in Perm, Russia (aka Valery35 at the Google Earth Community) continues his prolific output of cool Google Earth files. He has been converting a variety of data sources about our environment from NASA into cool Google Earth visualizations. 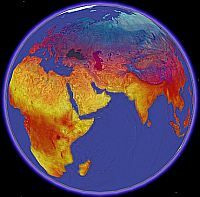 Today Valery will share with you this collection of overlays showing the progression of day time land temperatures for the Earth for entire years starting with year 2000 until 2005. 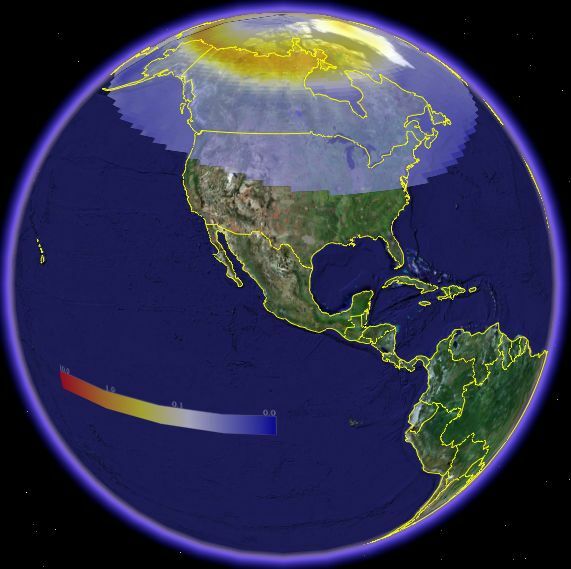 The data comes from NASA's Moderate Resolution Imaging Spectroradiometer (MODIS) satellite project. These are not satellite/aerial photos, but are images of temperature data overlayed on top of GE's satellite photos. Once you download the Day Land Temperatures file, you will see some sub-folders for each year. You should open these sub-folders and turn on each month to look at the data. On my system, if I just turn on an entire year, it kind of animates the overlays while loading them the first time. But, a better way to see the progression of the data is to use the movies Valery has created: small movie (1.2 Mbytes) or larger movie (3.7 Mbytes). Great work Valery! I'll be sharing some other similar stuff Valery has done later this week. Let's do a little fun sightseeing for the weekend. This collection of placemarks was done by "H21" from the Google Earth Community. 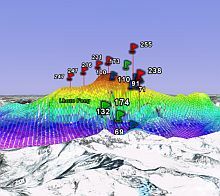 H21 shows the highest points geographically in 177 countries. You can go to each location, checkout the satellite or aerial photo, and try tilting your view so you can see the height and shape of the 3D landscape at an angle. 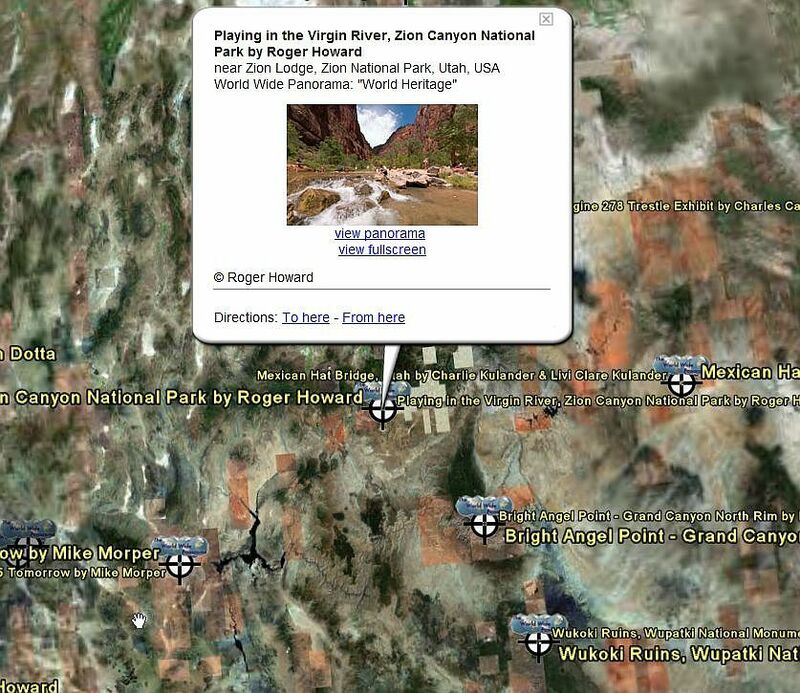 Turn on Google Earth Community layers to see other interesting information about the area. 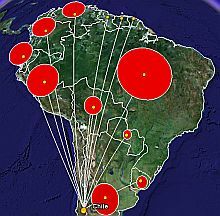 The post for H21's collection is here in case you want to tell H21 about the locations for other countries, or have a correction to send him. H21 has done a number of interesting collections including those I've written about here: "Around the World in 80 Days", "Places Quoted in Shakespeare", and "Castles in Highres"
Speculation on Microsoft Plans for "Google Earth killer"
The first time I saw Google Earth and wondered about similar applications, I thought about Microsoft Flight Simulator (MSFS). As a pilot who frequently uses MSFS to maintain flight skills, I am quite familiar with the flight simulator. Even though MSFS uses a more programmatic approach for showing scenery detail, the views of the Earth can be amazingly realistic and, with some add-on satellite and aerial photography, MSFS can look more real than Google Earth's views. I worked for 20 years in the computer graphics field doing work for NASA and the DOD primarily doing simulation (space, robotics and flight simulations). The evolution of computer graphics technology and how flight simulation and gaming technology have advanced the field is fascinating to me. You see, my passion about Google Earth is not just because it looks cool. I've been watching for signs about what Microsoft would do to compete with Google's 3D application. Well, an Alan Glennon from the University of California at Santa Barbara has just released his observations. Alan works at UCSB's Department of Geography and has his own blog called Geography 2.0: Virtual Globes. 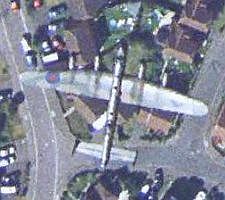 Alan has written an interesting article called "Will Microsoft have a Google Earth?". He points to a job post at Microsoft for a "program manager to lead a project integrating their flight simulator engine with Virtual Earth". Alan speculates how Google can compete with Microsoft when it combines its gaming development skills with its dominance in the operating system software domain. He speculates whether Google might buy its own gaming company. Alan also says he's watching the evolution of KML which is a crucial component of what makes Google Earth so valuable. Those of you interested in the strategic positioning of Google Earth verses future competition from Microsoft should definitely give this one a read. Alan gives some insightful thoughts about possible directions. 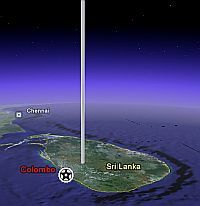 One of my favorite collections of placemarks for Google Earth is the World Wide Panorama which shows the locations of Quicktime viewable panorama photographs taken by photographers all over the world. You can view the satellite or aerial photos of the location, plus the 3D terrain in Google Earth. And, you can compare them to a "3D" photograph of the same location in much more detail. Earlier this month they updated the WWP collection and included a list of the Best of 2005 panoramas. After you downlaod the GE file, turn off the entire collection in the "Temporary Places" folder by clicking on "Worldwide Panorama". Then, turn on the "Best of 2005" subfolder to just see those panoramas first. Afterwards, you can turn on the other folders and continue to explore. You must have Quicktime installed to view these pictures. The photos are not really 3D. They are more like pan/tilt panorama photographs than 3D. Some are just panoramas, but some show photos in a complete 360 degree sphere you can pan/tilt as if you are really there. I especially like the ones taken from airplanes or kites. Here is the official Worldwide Panorama web site. Google has just announced new satellite/aerial imagery data for Google Local - data that has already been in Google Earth for a few weeks. Google Local now sees the more up to date data already in Google Earth, and they have added TWO EXTRA ZOOM LEVELS for Google Local! 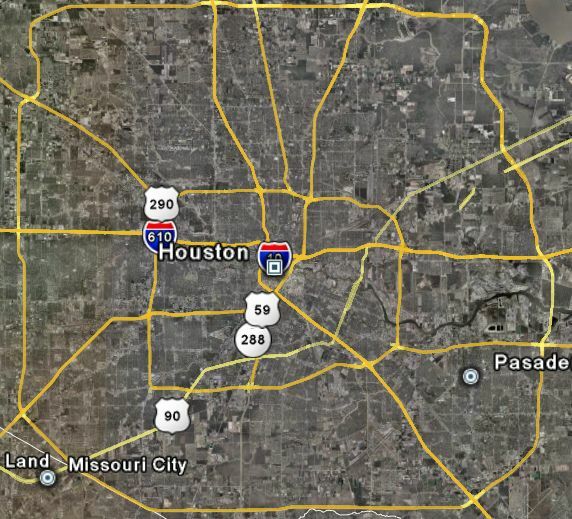 You can still zoom in farther in Google Earth, but it's nice to have the two applications come closer together. Here's the blog entry at the official Google Blog. In previous stories, I have mentioned one of my favorite applications for looking at GPS tracks is GPSVisualizer. 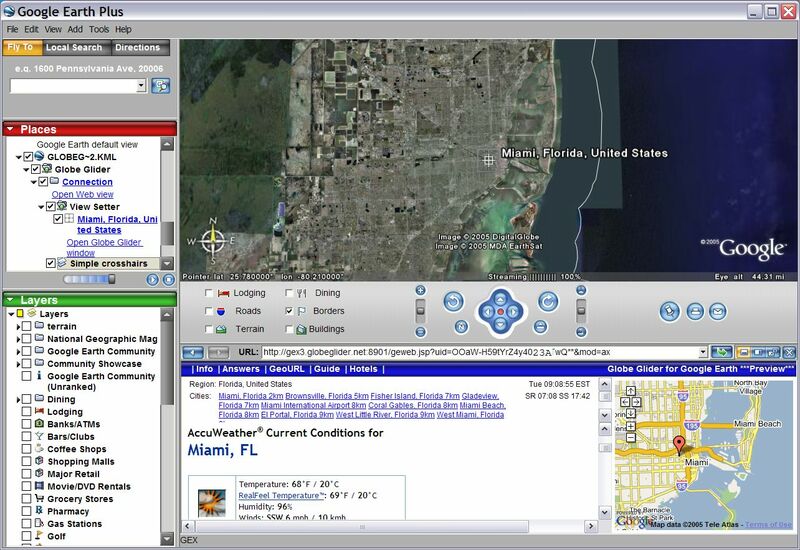 It is a free web browser application with a simple form-based interface with many capabilities for showing GPS tracks with satellite/aerial photos, street maps, topographical maps, and more. 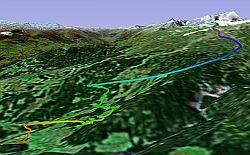 In November, after I E-mailed him, Adam Schneider, the author, implemented a capability to generate Google Earth files from GPS tracks. 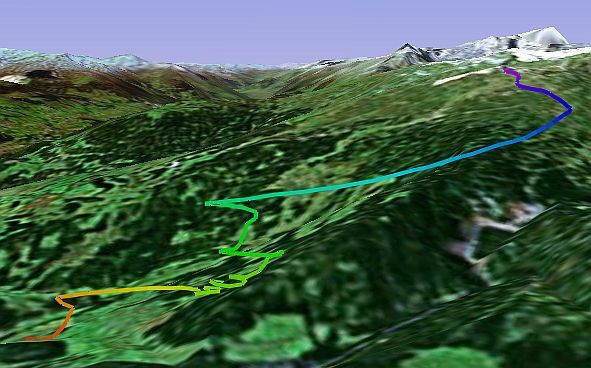 However, one of my favorite capabilities in the pre-GE version of his application was the ability to colorize the tracks according to various parameters (such as altitude changes, speed, course, etc.). Unfortunately, his initial GE form didn't support this colorizing feature. Well, Adam wrote me this weekend to let me know he had implemented colorization for his Google Earth form. I immediately tested it with flight, and other GPS data, and it works very well! By the way, GPSVisualizer supports a variety of input file types in addition to GPX. For example, I tried an IGC file format which is the format used by paragliders because it supports certified data for establishing records (longest flight, highest flight, etc.). I went to the Leonardo database of paragliding flights and downloaded an IGC file. Then, I used the new GPSVisualizer form, and uploaded my copy of the IGC file. I then selected "Absolute" for "Altitude Mode", and "Colorize by" -> "Altitude/elevation". 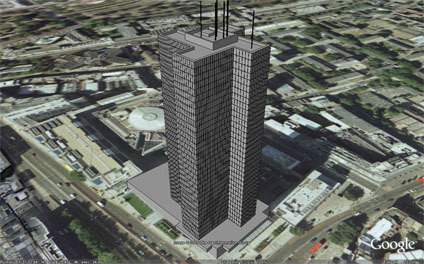 Then I selected "Create KML File" which resulted in this Google Earth file . You need to select the absolute mode for altitude so it keeps the elevation data from your GPS track. If you have GPS tracks of a hike, a drive, a flight, etc. I highly recommend you try converting your track to a supported format (GPX is probably the easiest). Then try out GPSVisualizer and its new "Colorize by:" feature. 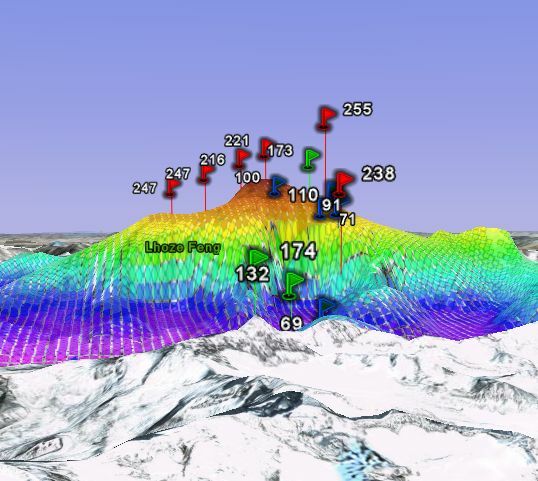 The "colorize by" feature supports: altitude/elevation, speed, course, slope, distance, and more. Adam had to do something clever to make this work. His application breaks up the track into little peices and changes the color for each segment according to the parameter you chose to color it by. Great work Adam! 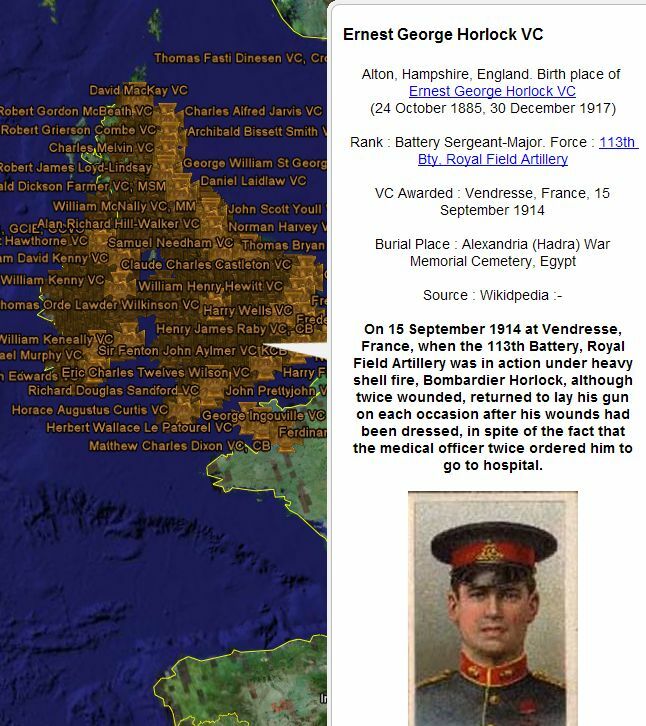 One of the Google Earth Community members who calls himself "Up_The_Spurs" has just completed an excellent collection of placemarks related to the Victoria Cross. The Victoria Cross is the highest award for gallantry, on the field of combat, for all British & Commonwealth Citizens. 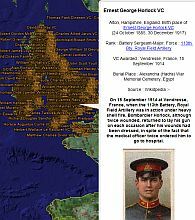 There have been 1351-1355 VC's awarded, and they are all included in this collection. The collection shows the placemark of the birthplace of each recipient and provides details on the recipient including when they lived, why they received the cross, and sometimes even pictures. Much of the data came from the Wikipedia. But, he also used other sources. You can read details about what was done in his post here. This was quite a big task which took Up_The_Spurs at least 3 weeks to complete. Great work! See his Boxing Champions collection as well. Someone at the Google Earth Community, who calls himself 'Sanga', recently posted the highest-fidelity 3D model of the Eiffel Tower yet. 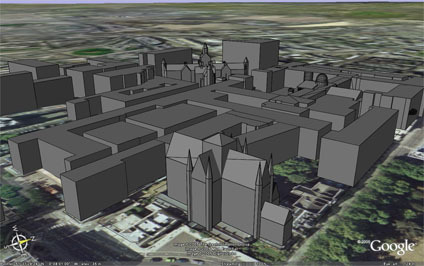 He used SketchUp (a 3D modelling program which has excellent conversion tools for Google Earth). 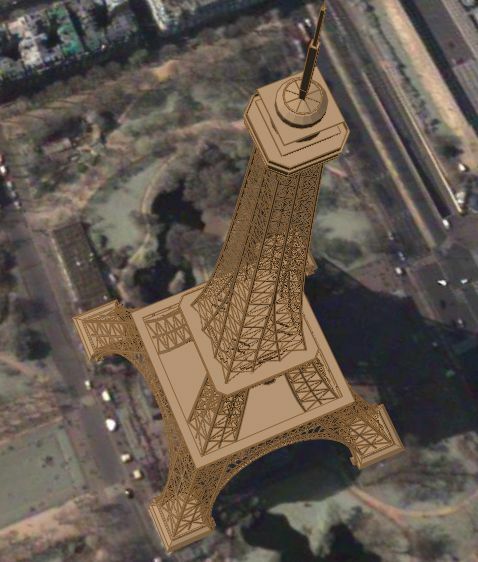 He posted two versions of the Eiffel Tower - the larger one has a huge number of polygons, the smaller one still looks very good (and you may want the smaller one if you have less graphics memory). Turn off the "Terrain" Layer as this messes up the view of the base of the tower. Here they are: Eiffel Tower (1.8 Mbytes) and Eiffel Tower (1.04 MBytes) . By the way, Sanga also developed a very detailed 3D model of the Taj Mahal (2 Mbytes) . Here's his post for this one. 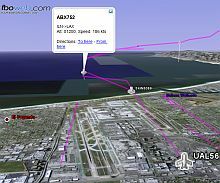 For a couple of weeks a guy called Sven from the Netherlands has posted his attempts to add 3D planes to the FBOweb real-time flight tracking application written about here before. 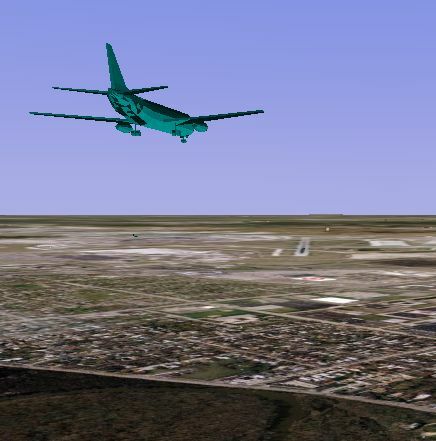 Well, Sven has succeeded in creating a new version of a network link which places 3D airliner models in the correct 3D position from the fboweb application. NOTE: when you download the 3D plane flight tracker , make sure you turn on only one airport in the Places folder (ORD, LAX, BOS, or ATL) at a time as these network links use a lot of bandwidth. Also, you can double click on a flight folder to position yourself over a plane, then open that folder to find "Points of View" which allow you to select other views including different angles from the pilot perspective, directly above, or directly toward the plane. The network link updates every few seconds, so you may have to change your views often. The application doesn't actually know the orientation of the plane in flight, but I believe he takes the short track from the previous position report and computes an angle of orientation accordingly. The orientation does look correct most of the time, or just off by a few degrees. Sometimes the flighttracker position data looks messed up, I saw one position report with planes on obvious collision courses. So, please don't expect the position reports to represent actual real-life situations. 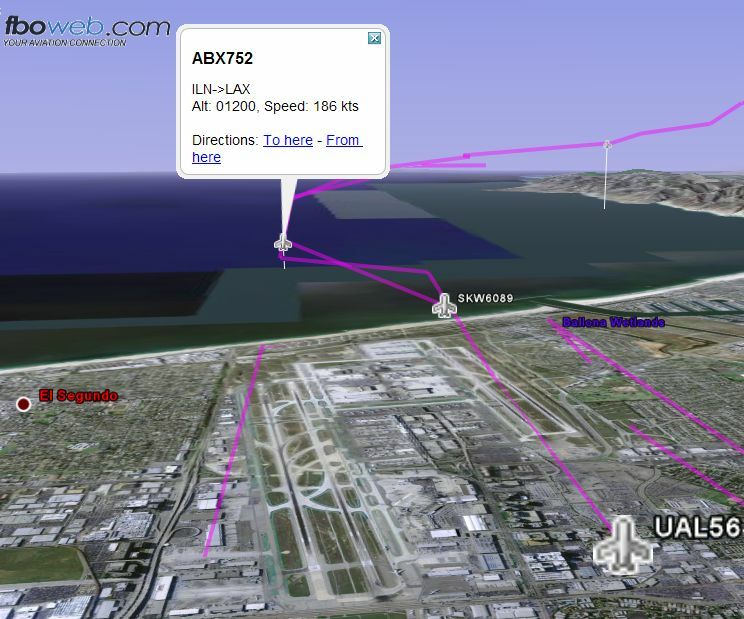 Despite the anomalies, this is a really cool addition to the flight tracker. This is great work Sven! Thanks for telling me about it. Three men in Brazil decided to sail across the Atlantic Ocean in a 40 foot long sailboat (monohull) named "Mussulo". The reason is apparently based on at least one of them having always dreamed of returning to Angola, a country he had left 30 years ago. 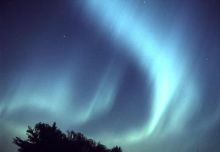 They chose to take full advantage of Google Earth both to allow people to follow the trip, and to provide and anaylyze weather data. They have been using amateur radio for communication, and I presume GPS for navigation. Most significantly, Mussulo completed the journey to Angola and they have begun the trip back to Brazil. 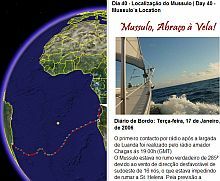 The crew of Mussulo have been posting updates to the Google Earth Community (in both Portuguese and English translations). The Google Earth file they have posted not only provides the track and weather information, but also shows placemarks with "log" entries (also in both Portuguese and English - make sure you scroll down to see the English). The file is a network link so it automatically updates when they provide new entries. The crew of Mussulo have a blog which shows lots of screenshots of how they have been using Google Earth to document the trip and analyze weather. The name of their web site: "Abraço à Vela", loosely translates (according to Babelfish) to "I hug to the candle". From what I can gather from the posts their objective was to join hugs across the ocean. It is surprising, considering my passion for sailing, I have not noticed this interesting sailing adventure. My only excuse is that the posting was in Portuguese, which I don't speak. Anyway, my congratulations to this valiant crew for having made it across the oceans, and I wish them fair winds for their safe return! This is the first book covering Google Earth I've seen announced (not yet available, but you can pre-order it at Amazon). The book is titled "Hacking Google Maps and Google Earth" by Martin C. Brown at Extreme Tech. From the description I don't think it has a lot of real new stuff on "hacking" Google Earth, most of the focus in the description seems to be focused on Google Maps. However, the listing says the book is 500 pages, so maybe there is more to it. 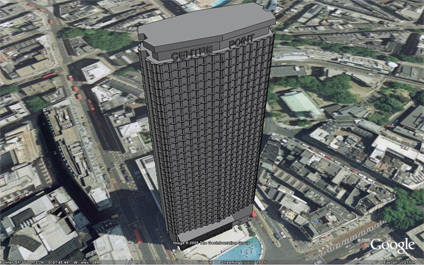 Perhaps a listing of some of the best Google Earth KML files, with screenshots? Or, perhaps he covers how to use your GPS, do image overlays of your own satellite photos or weather radar images, or write your own KML and network links? I expect this will be just the first of several new books we'll hear about covering Google Earth in the next few months. I'm curious how many of my readers here would be interested in a book about Google Earth? 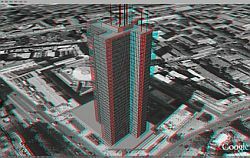 Hoy, el Dr. Smith publicó un imagen estereoscópica (una foto que viéndola con anteojos rojo/azul se puede apreciar en 3D) de uno de sus edificios. When Google Earth for Windows went out of beta last Tuesday, a new item was added to the features list of Google Earth Plus (GE+): Enhanced network access. That's right, if you buy the Google Earth Plus version ($20 per year subscription) you not only get the ability to draw paths and polygons, GPS integration support, greater printer resolution, and data import capability. But, also you get faster network access. Apparently this feature already existed for some months, but just wasn't documented. So, if you already have GE+, you have already been getting faster access. According to the Google Earth development team, the feature enhances the download speed of the databases compared to the free version of GE. Here's a comment from one of the team members at the Google Earth Community: "Upgrading to Plus should improve network performance at least a little and in some cases a large amount (especially if you have a long latency to our servers). " So, if you've been thinking about getting GE+, here's another reason to consider it. Those of you who are real addicts (like me) might want to give it some thought. :-) Anyway, if you want GE+, just select "Upgrade to Plus" in the Help Menu of Google Earth. 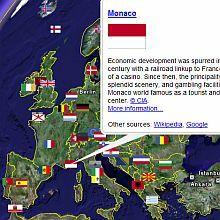 A few months ago I wrote a story on a collection of placemarks which provided all sorts of details on countries, their flag, and links to other sources of information on the countries. This collection does something quite similar except it uses the flags as the placemarks, and uses the CIA World Factbook as the basis of its information. 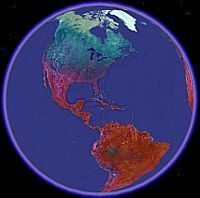 The CIA World Factbook is a nice collection of public information on countries of the world made available by the US government on the Internet for many years now. When you click on the country flags, you will see an excerpt of the background information (usually a historical/political perspective) from the Factbook, a link to the complete information, and links to both Google and Wikipedia information on that country. I recommend you click on "Borders" on the left, in the navigation window of GE, to show country outlines. This collection was put together by the GEC community member known as 'Herrminator' who also published the excellent collection of World Heritage Locations written about earlier. Nice work Herrminator! Google Earth onf the Mac also won't be capable of running specialized applications like the Globe Glider which uses Windows-only IE scripts to perform its magic. But, almost all standard Google Earth files and network links reportedly work just fine. All other features seem to work quite well, and only a few people will miss the features not yet implemented. Google has created a "Google Earth for Mac OSX" Support Forum at the Google Earth Community. If you want to see what current problems people are experiencing, or want to report your own, go to that forum. The list of new airports includes: Boston (BOS ), Chicago (ORD ), Atlanta (ATL ), and New York (JFK ). I highly recommend you turn off one airport's network link in the Places folder before you turn on the other (otherwise there is too much information). You can view the fboweb.com web site for these Google Earth files here. Also, make sure you tilt your view so you can see the 3D view of the plane tracks. For those of you with multiple mouse buttons: using a mousewheel is the easiest way to raise or lower your viewing point (or you can hold the right mouse button and slide forward and back). Alternatively, you can use the CTRL-UP ARROW or CTRL-DOWN ARROW keys on your keyboard. Finally, you can use the visual controls on the Nav panel with the + and - symbols. All of these methods adjust your altitude above the Earth's surface. You can see your height above sea level in the lower right of the GE viewing window. You can move the Earth to position it where you want to see by clicking a point with the left mouse button and slide the cursor to the middle of the viewing window. This way you can learn to zoom in and see the closest possible view of the aerial and satellite photo views of the Earth. At first, many people don't realize Google Earth is much more than a map with aerial and satellite photos attached. 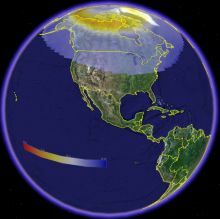 GE uses data from NASA Space Shuttle missions which provides 3D terrain data for the entire land surface of the Earth. Let's demonstrate this. 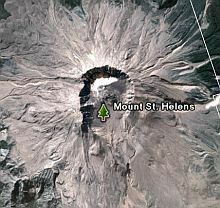 Click on this link to go to GE and fly to Mount St. Helens. Beautiful view right? But, try this: hold your PAGE DOWN key on your keyboard and watch GE tilt your view so you can see Mount St. Helens as a 3D mountain. Very cool right? PAGE UP will tilt your view back up. You can also use the controls on the right side of the navigational control panel for tilting. You can hit the "u" key to tilt back straight up automatically. The "r" key will reset to north and tilt up. An easier way to tilt and pan your view is to click and hold the middle mouse button or scroll wheel button (those of you who have a Mac with one mouse button have to use the above key or navigational control techniques). While you're holding the middle button if you move your mouse forward and backwards it will tilt the view. Side to side will pan your view around the point you are looking at. Holding the SHIFT key will constrain your tilt and allow you to rotate your view about a point. 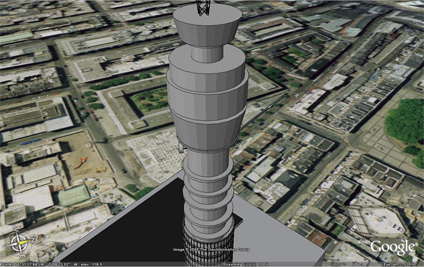 Check out other tips for using GE in the Google Earth Blog tips category. If you haven't seen it, read Google's basic tour as well. Google has finally made Google Earth official - it's not a beta product anymore. Now even more people will be able to use Google Earth for sightseeing, business applications, GIS applications, sports, planes and flying, and more. Welcome to all the new Google Earth users downloading GE for the first time. 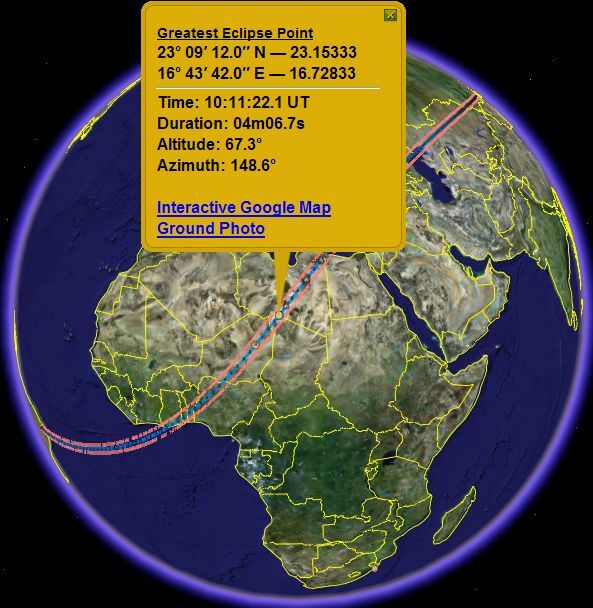 Read Google Earth tips as you learn more about the program. The announcement was made at the Official Google Blog. 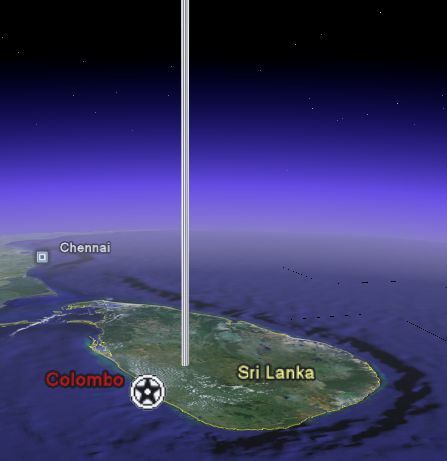 Also part of the announcement, the Mac version of Google Earth is now available (see this story). 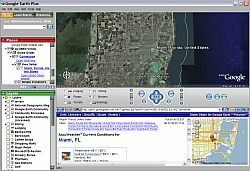 Google Earth version 3.0.0762 for Windows XP, which was released in November, was deemed worthy enough for the announcement of official release. The Google Earth team has worked very hard in the past 6 months, since GE first went into beta, with several public updates addressing problems and adding features to the program. For some time now I've been predicting they were about to make the product official, and after the announcement of the Google Pack at the CES Keynote last Friday, I knew it had to happen soon. So, now, as an official product, maybe Google will put even more PR muscle behind this really awesome program. I expect the media will be writing more about Google Earth in the coming weeks and months. If you haven't downloaded Google Earth yet, you are missing out on one of the most amazing free programs ever made available on the Internet. Congratulations go to the hard-working Google Earth team (with a little help from a few million beta testers). Google Earth announcing Mac version today! This is the one many people have been waiting for! Today, in time for MacWorld, Google has announced the availability of a version of Google Earth for the Mac! There's a link off the home page for GE at http://earth.google.com/ to the Official Google Blog announcement. There's also a screenshot of the new release. Also, the word "Beta" is missing from the Google Earth logo! The version released is for Mac OSX 10.4 and up, so upgrade if you aren't there yet. GeoTag Your Flickr Photos WITH Google Earth! Last November a new web site called FlickrMap was announced by Mark Zeman which is an excellent tool for viewing geotagged (tying earth coordinates to a photo) Flickr photos in a Flash map (a small US$5 subscription is required to have your own map, but it is free to just geotag). FlickrMap was already cool in its interface for viewing geotagged photos on an interactive map, but you still had to use a variety of tools and steps to geotag your photos. Well, Mark just contacted me to say he has written an AJAX application which allows you to quickly and easily geotag your photos using Google Earth for the interface. This is the fastest and best method I've seen yet for geotagging. Not only that, but Mark produced a really excellent video tutorial showing you the steps for using his application with Google Earth to Geotag. 4. Click on the placemark and click on "Geotag Flickr Photos with this location"
5. You will then go to Flickr and select the photos you want for this location. The ones you select are now geotagged. After the first time, all you do is turn on the Flickrmap network link and start geotagging. It's really that easy. A very nice capability! Thanks to Mark for both writing this excellent application, and letting me test it. This is another example of integrating other applications with Google Earth creating whole new capabilities never expected by Google themselves. A few days ago I wrote about Globe Glider which lets you use Google Maps within Google Earth. When Google improves the API and KML with new capabilities we will see even more exciting integrations like this in the coming months and years. An off road enthusiast from the Google Earth Community (who calls himself TommyAfrika) forwarded me some forum threads dedicated to off road races. The first is for the Dakar 2006 which is probably the most grueling off road race in the world from Lisbon, Portugal to Dakar in Senagal in western Africa. The Dakar race goes through some of the most inhospitable terrain on the planet. Unfortunately, the Dakar 2006 did not choose to publish GPS coordinates for the positions of its racers. So, all we have so far is an image overlay and waypoints of the course. Here's the forum thread which includes some good links to videos describing the course - here's a documentary video (English - other languages available in the forum) about the Dakar 2006. 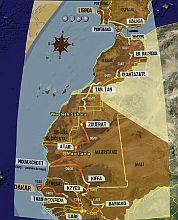 The Dakar 2006 is currently in day 9 out of the 16 days it is estimated it will take to complete the course. Another off road race held in November, 2005 was the Tecate Baja 1000 rally. Here's an overlay showing the course of the Baja 1000 rally , and here is the GEC forum thread about it. 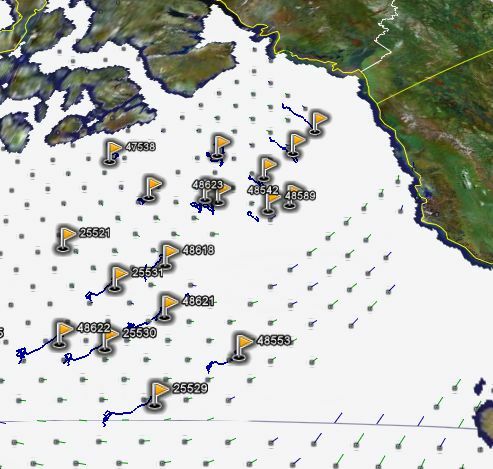 These races need to publish their GPS data so you can follow them in Google Earth like the current round-the-world sailing race called the Volvo Ocean Race. Google announced during the CES Keynote last night that they have begun working with at least one car manufacturer (Volkswagen) to explore putting Google Earth/Local as an embedded application for car navigation. gpsreview.net has written some interesting thoughts about this announcement saying Google has all the makings of a good car navigation system now, except you would need $26,000 in equipment to store the entire Google Database in a car, since broadband connections to cars are not available yet. He was just speculating on what it would take to put the whole thing in the car of course. Actually, you wouldn't need the entire database since cars rarely travel the entire surface of the Earth. In fact, existing car navigation systems usually get by with just a couple dozen Megabytes for maps and points of interest (POI - things like restaurants, addresses, hotels, etc.). You would need more space to store satellite/aerial photography though. I suspect a 200Gbyte hard drive could store all the data needed for Google Earth for an area covering several states in the US. The other thing to consider is that with a WIFI connection in the car, the car could do literal "war driving" and pick up data as it moves from location to location from the Google database. A better solution would be legitimate WIFI connections placed in locations entering and leaving cities or states. Rest area WIFI maybe? 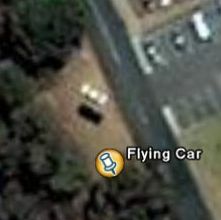 By the way, there are people already using Google Earth in cars today. 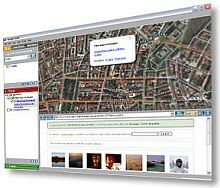 You can read about people hooking up their GPSes to Google Earth if you go to the Dynamic Data Layers forum at the GEC and search for "+GPS +Navigation". And, someday a streamlined Google Earth for embedded car systems may be quite practical. The CES Google Keynote just started 5 minutes ago. It started out with Google Earth being shown flying over the Eiffel tower, then to one of the Africa Megaflyover images, then to the Grand Canyon, and then to Las Vegas (where the CES is being held). Next, Larry Page (co-founder of Google) shows up in a lab coat on the stage on top of one of the robot SUVs which raced in the Darpa Robot challenge! (see live reports from the show at Engadget). Larry said they are working with VW to put a live version of Google Earth in your car dashboard. They did a demo of it showing an aerial view of where you were driving. Very interesting! Both the Google Video Store deal and the Google Pack mentioned earlier have been announced in press releases at Google (Video and Pack). The Google Pack includes Google Earth. You can download the Google Pack now at Pack.Google.com. As far as I can tell, it is the current beta version of Google Earth, nothing new. Google Local Mobile was shown on a Blackberry earlier in the presentation. Here's a link to the new Google web page for downloading GLM. It reportedly works very well on the Blackberry. They are doing the Q&A now, so it looks like there's no chance for any mention of new Google Earth stuff. From the comments being posted at Engadget it looks like Google's going to get a beating from a lot of analysts (especially Mac and Linux users). The Google Pack contains no real new products, and the Video Store won't really compete with the iTunes videos because they don't support the Mac. Apparently some people think the GLM thing is the biggest new product released at the keynote. I'll wait until I see the video of the presentation before I make any further observations. Here's a link to a portion of the keynote on video from CNET. This part covers the Google Video Store announcement. Just couple of hours from Google's big keynote address and I've just read a blog entry that a company is trying to have Google Earth shutdown due to patent infringement. Here's the article in the Arizona Republic newspaper (Arizona is where the case is being heard). Let's hope Google is able to settle this case before a shutdown is necessary. According to the story, Google has until January 18th to respond to the motion. Google's Larry Page (co-founder of Google) will be presenting a Keynote address at CES today at 4PM PST. The rumors have been flying about what will be announced from a new Google PC to a software package called Google Pack. The Google PC rumor was shot down by Google themselves. The Google Pack, if this is true, will include a number of packages like Firefox, Norton AntiVirus, RealPlayer, and a number a Google packages like Google Toolbar and of course: Google Earth. You can read some interesting speculation about the Google Pack at the blog Inside Google. It's my hope they will announce Google Earth is out of beta and/or even more forthcoming updates to the Google Earth databases. As soon as I find out what is announced, if it applies to Google Earth, you can read about it here at Google Earth Blog. 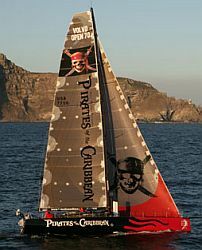 Leg 2 of the Volvo Ocean Race (an around the world sailing yacht race) began on January 2nd. You can get the details about the race and Google Earth network link in my earlier stories here and here. Or you can just download the network link now. By the way, two of the boats have turned back to South Africa due to damage near the start of leg 2. Team Ericsson stopped racing and turned back with a failure of one keel actuating ram, and then Brasil 1 turned back with structural failure in the region of the cockpit. These boats are very powerful, but the southern ocean is very menacing. The boats have to be very careful in these dangerous seas, winds, and ice. In order to win, you have to finish! The two boats returning may be able to effect repairs and return to the race. 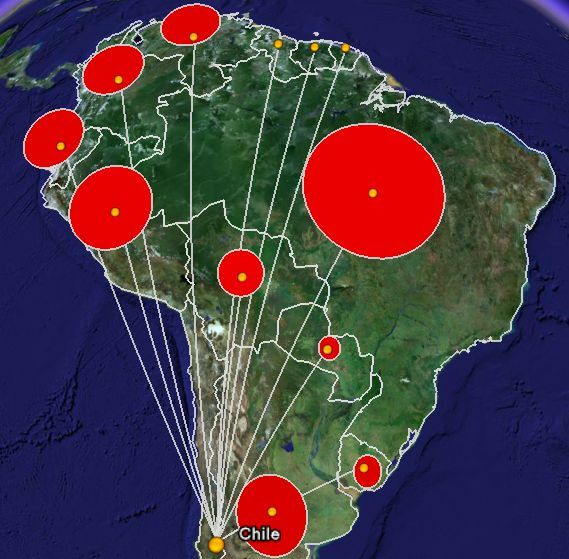 A few months ago Declan Butler, a Senior Reporter for Nature Magazine, began publishing work he was doing to provide data on the Avian Flu outbreak using Google Earth. Declan has continued to work on the data, and recently announced an update on his blog. 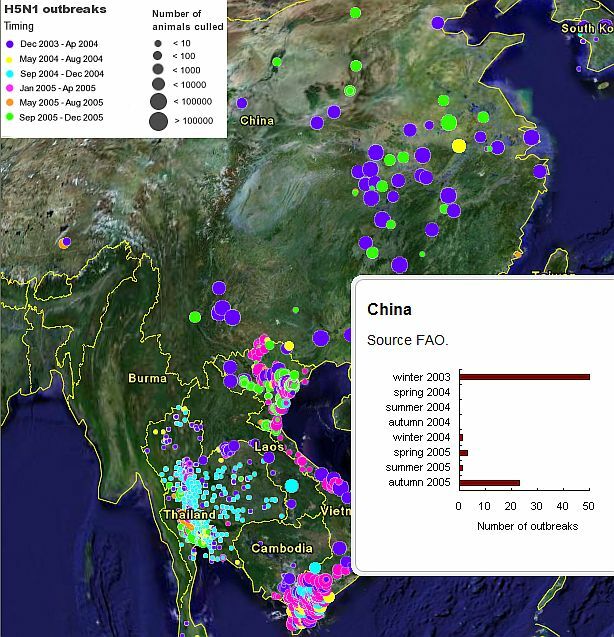 The update includes a greatly improved look and even more recent data on the outbreak of avian flu. 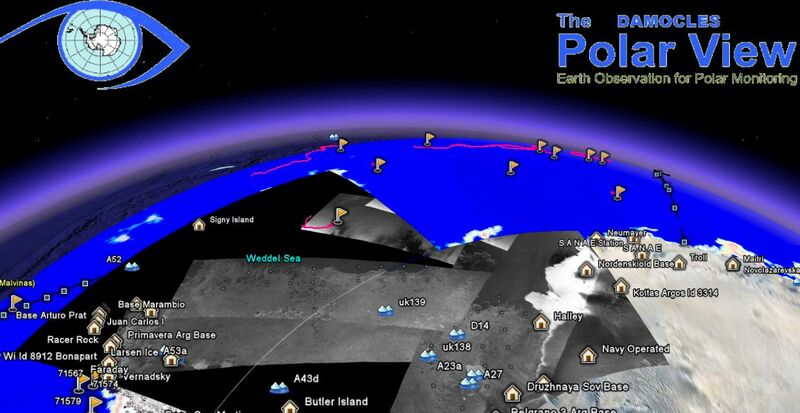 As you would expect from a Senior Reporter of a scientific magazine, Declan includes details on the data, how he compiled the data, and issues with presenting the data within the Google Earth file. 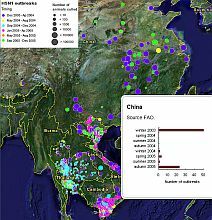 He also provides details on how he implemented the Google Earth KML, and credits suggestions given to him which helped him improve the data presented. Stefan Geens at OgleEarth wrote about this today and he points out some of the issues Declan (and others) encountered in the GE user interface presented by large datasets like this. In particular, Stefan mentioned the need for a time-based animation feature in GE and points out that Google's Michael Jones recently demonstrated an in-house capabiility to do exactly that type of feature (so, we can only hope that feature will be availiable in a future release). Being able to show the spread of the flu over time with an animation would be quite powerful. Tropical Storm Zeta was one of the only Atlantic Tropical Storms in recorded history to cross over into a new year (since tropical storms are so rare in the winter in the north Atlantic). NASA occasionally releases high resolution enhanced satellite photos, and I've created an image overlay for Google Earth of one for Tropical Storm Zeta . 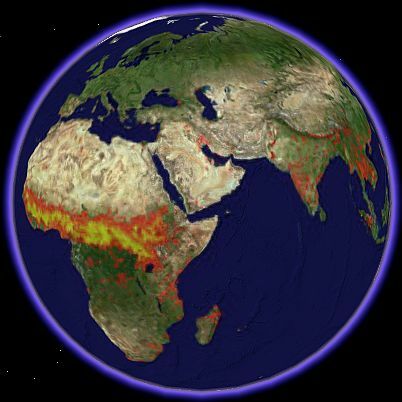 The image is a 1km resolution photo courtesy of MODIS Rapid Response Project at NASA/GSFC. You might want to try this automatic Hurricane Tracker to keep track of this and other storms around the world. Read this story for more information on this hurricane tracker. Ever since Google Earth was first released, I've thought teachers of all sorts would find it an indespensible tool for teaching. In particular, I'm sure geography lessons are being transformed by Google Earth. It turns out there are some web sites to help teachers use Google Earth for Geography. There is a site dedicated to tools on the Internet for enhancing geography called JuicyGeography (www.juicygeography.co.uk) which is written by a teacher in Somerset, England. 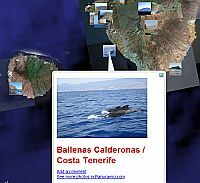 The teacher has a growing resource for teachers for using Google Earth to teach geography. Included are suggestions for lessons and resources (GE Files and placemarks) to build lessons. One of the most interesting lessons is a decision making exercise letting students evaluate the hazards in an earthquake in San Francisco. 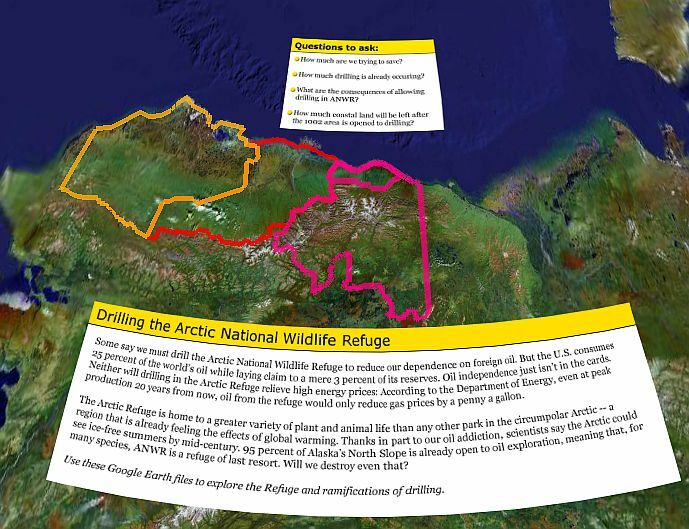 Ideas also include doing image overlays, using GIS data, mapping, using GPS, and more. Another useful geography site from the UK is called GeographyPages.co.uk. The teacher responsible for the site recently was awarded Royal Geographical Society - Institute of British Geographers Innovative Geography Teaching Grant. He has also developed an extensive collection of notes and references for using Google Earth to teach. 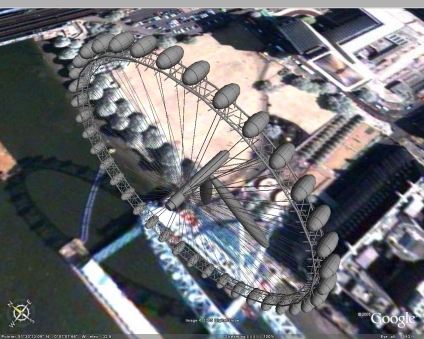 Looks like the UK educators are first to see the opportunities with Google Earth and start writing about it on the web. 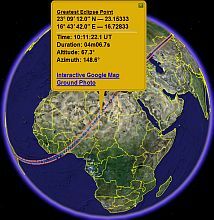 Are there other similar web sites for educators who want to use Google Earth? Leave me a comment here, and I'll write about them in future stories and add them to the Reference section. Another entry for the sports category. 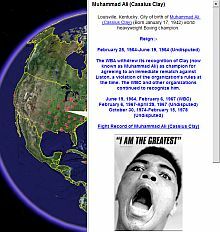 One of the Google Earth Community members who calls himself 'Up_The_Spurs' recently posted a collection of placemarks for the birth places of all the heavy weight boxing World Champions. His collection goes from John L. Sullivan in 1882 to Nikolai Valuev on December 17, 2005. The collection of placemarks shows not only the location of the boxing champions' birthplace, but also provides details on the boxer. Included are date of birth, reign, a photo, and background on most of the champions. 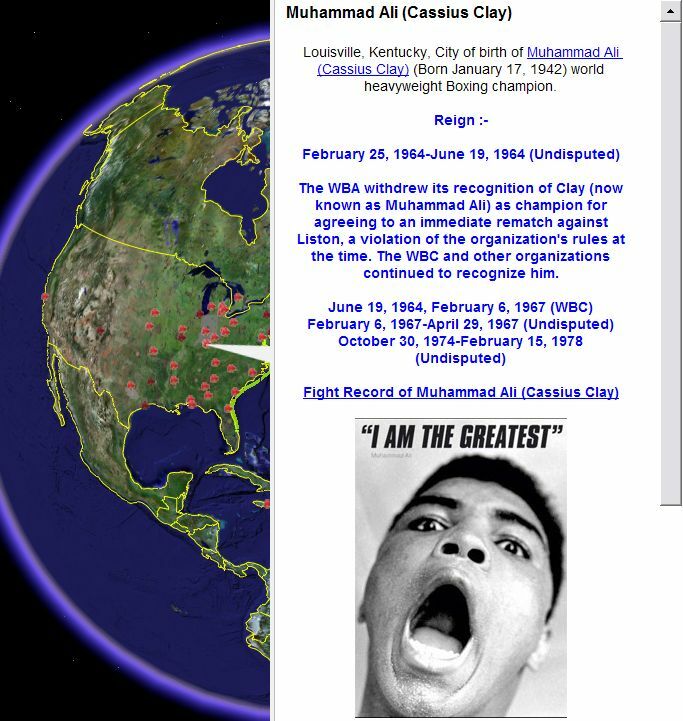 I've included a screenshot of Muhammad Ali for example. Nice work 'Up_The_Spurs'.